Beach Wedding Orange Beach: Surprise Your Guests With a Beach Wedding! Surprise Your Guests With a Beach Wedding! If you have gotten started on your wedding planning, but the traditional venue ideas are not doing it for you, you should consider a beach wedding! This unique venue is great for making your wedding memorable to friends and family, and providing a beautiful backdrop to your ceremony. Beach Weddings Alabama in Orange Beach has all-inclusive, or ceremony-only packages that will make your wedding an event to remember. We want your wedding to be as easy, stress-free, and beautiful as it can be, and the beach location will elevate your ceremony to the next level. When you choose to have your wedding on the beach, you instantly are decorating with the beauty of nature. There is no need for elaborate decorations when the sun, sand, and waves are in the backdrop. If you want to add in simple flowers, or even seashells, these decorations will be right at home on the beach. A beautiful sunset is more of a backdrop than any indoor wedding can produce! The beach is inherently scenic and romantic, and harnessing this natural beauty will make your wedding amazing. Imagine the waves lapping in the background, a brilliant blue sky, and soft sand under your feet. Everything in this picture lends itself toward making your wedding an unforgettable event! You don’t need to rent a church or a fancy hall to hold your wedding ceremony when the beach is beckoning. And while you can be as fancy as you would like, the beach definitely lends itself to a casual, carefree vibe. If you want to be a little less formal with your clothing, the beach is the perfect place to do it! You can save on decorations when you have all of the beauty of the beach to form your backdrop. Flowers can be simple when the waves take center stage. 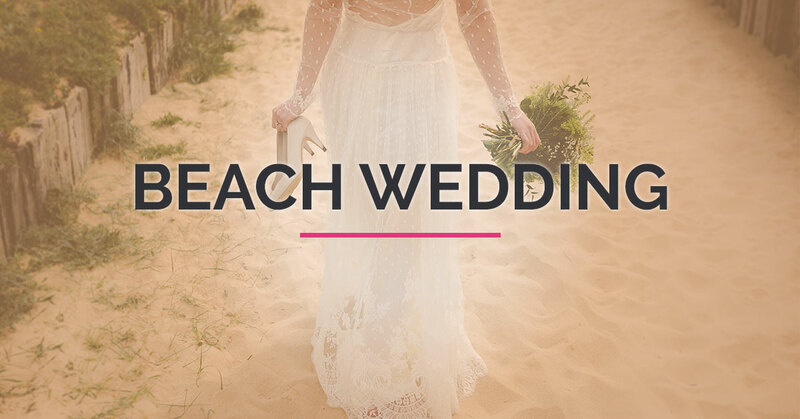 Beach Weddings Alabama has the added benefit of providing not only the ceremony venue, but the catering, reception, Dj, flowers, cake, and photography if you desire! We are truly all-inclusive, and can make your wedding not only extraordinary, but affordable. Maybe you have been a guest at many lovely weddings in the recent past, and are wanting yours to have a little more flair. A beach wedding is a truly unique experience that will help your wedding stand out and give you great memories for a lifetime! If trading a floor for soft sand, indoor lighting for the rays of the sun, and getting the accompanying music of the ocean sounds like an ideal setting, then a beach wedding is something to consider. Even if you live close to the beach, there is something special about the sand and the ocean that makes a wedding there feel as exotic as any destination wedding. Avoid lengthy travel and guests not able to make the trip, with a beautiful beach wedding closer to home. If you are a beach lover, or the beach holds a trove of romantic memories for you and your significant other, a beach wedding is the perfect way to tie the knot. Your wedding is a special event that should be beautiful and memorable. If you are searching for the perfect location, a beach wedding will give you a gorgeous backdrop to your special day. Beach Weddings Alabama not only gives you this great location, but also can provide you with the reception and other details, making your wedding planning less stressful and time consuming. A unique location sets the tone for a great wedding, so do something different, and surprise your guests with a beautiful beach wedding!